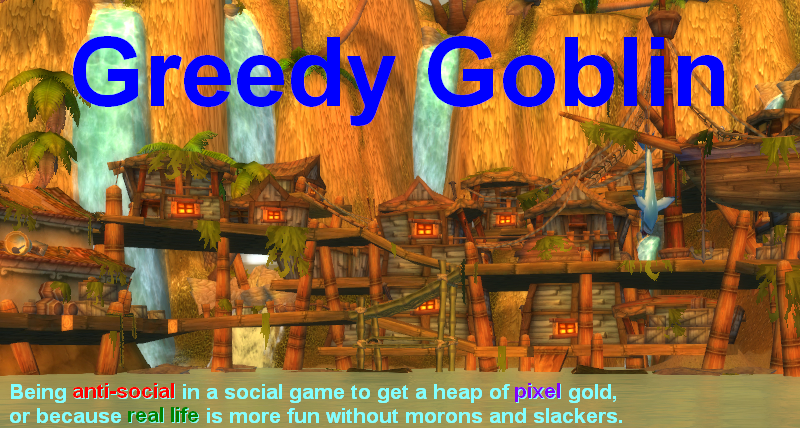 Greedy goblin: The best Christmas present: Goons offer half region to MoA as ransom. The best Christmas present: Goons offer half region to MoA as ransom. I'm sure you remember me as the former diplomatic director for Goonswarm and the CFC. We had several discussions a few years back. I wanted to reach out to you because we've come to a revelation lately that MoA are now our longest-living enemies. Everyone else we've fought in EVE over the years has collapsed, changed names, quit EVE or otherwise disappeared for long periods of time. MoA have endured, and as such I wanted to recognize you guys for that. We have an opportunity that has presented itself recently that I'd like to speak with you about. Specifically, we plan on moving out of several constellations in Cloud Ring and were looking for groups who might want to hold sov there. No standings changes. We want the group that lives there to be able to use the region, it's moons and resources to fight. Whether that's us, or syndicate groups, or lowsec isn't as important as the content. A Non-invasion pact. We want whoever lives there to know that we don't intend to run them out of the region unless there's a breaking of our agreement. We have had previous agreements with both allies and enemies that we've kept to (OTEC, PBLRD, Western co-prosperity sphere) and we intend to fully keep our word in this one. With this, we would ask for a token symbol of the busines agreement between us. Something that shows an ongoing committment to the arrangement without agreeing to be friends, allies or anything else. Strictly business. We can discuss this further if you're interested, and we would not discuss this publicly or acknowledge it if asked. I understand you you have a funding agreement with Gevlon Goblin that is contingent on contuing to fight goons. I would not want to endanger that and would encourage you to continue to use those monies to fight us, and also take the beneift of sov space to give your pilots more opportunities. Please let me know if you are interested. If you would like to check with our diplomats to verify that this is not a scam, please feel free to reach out to Cindare or Mirana Balari. Hahahaha! Goons are so desperate that they are offering a half region with all money moons without even asking for blue status! They only beg for a NIP, aka not entosising them out of Deklein. Of course it was rejected as Massa and Gen EVE are not Grath or Elise who sell their line members for some money moons and media deals. They are in for a win, not just "having some fun content". As I've said: Goons lost most of their PvP-ers and FCs. They are in their space only because of treaties like this. Please note that the Goon lists treaties with PL in his offer. I'm sure that if PL would decide to evict them, they'd be in Empire before February. But PL will never decide so, due to treaties. I've been laughing about it for a day, but didn't post yet as I suggested to continue the negotiation to get more chatlogs, soundclouds and other material with Goon higher-ups. The Mittani himself begging for a NIP would have been golden. But it's on reddit, so no point holding it back. By publishing this offer, MoA leaders didn't only reject it, but made it clear that approaching them leads to nothing but another embarrassing post. There shall be no diplomatic negotiations with Goons. There shall be no ransom! There will be blood! There will be war! There will be no Goons! Leave your treaty-pacified alliances and join MoA, OOS or Project Mayhem and evict the pathetic Band of Bookstarters! There will be no dragons, just medium shield booster carriers! Either MOA would set up and create content for goons or MOA would get sucked into the sov game that kills 9/10 null groups sooner or later. Good on MOA for rejecting that offer. This is just the same rental deal that goons have been offering to a lot of groups. Note how they state "With this, we would ask for a token symbol of the business agreement between us". By that they mean ISK. On top of that I'm pretty sure the only reason they offered it to MOA is to get more publicity for their group and in turn their site. They knew that MOAs response wouldn't be a quiet "no" and that it would be create blog post and reddit posts with people with pitchforks, and MOA (and now you) have played into their hands. Further, they offered a NIP, which you have immediately put down, but think about it realistically. While I don't expect MOA to agree, and I certainly wouldn't in their position either (because no way should they trust goons to keep their end of the deal), a NIP wouldn't affect MOA operations in the slightest as MOA don't go after strategic targets anyway. They go after ratters, haulers, travellers and stragglers. Scam? Oh yes... it's goons after all. Free publicity, eh, we've already seen the adverts indirectly here and directly elsewhere (o7 show and other eve related player adverts). Considering it was tailored directly to MOA as opposed to merely being generic: someone was having a joke. @S Riojas: and what was the point? Writing a whole page just so Massa sends him a 1-liner? I don't see the fun on the side of the Goon. @Gevlon: The fun part is that Goons now seem diplomatic, civil and trustworthy. Geneve on the other hand... Like a guy who named himself after a mass murderer in the first place and now rejected this offer in a way that only a man of his kind could do. Like a pleb. I'm all about content and what not and your meta campaign is awesome to read up, but this guy is just a terrible human being. Goons proved the point. Obviously, the Imperium wants to install MoA in Cloud Ring to help stave off the existential threat that is Pandemic Horde. PH is back in Cloud Ring in the Tinnimerci constellation. They must consider PH a greater threat than MoA. I think its more likely that if Moa had bit they would be distracted from killing goons by the need to defend cloud ring and their new moon goos. Stuck over in CR, defending stuff and using that null space = less time harrassing goons. @Noizy: while I assume you are joking, it can be true. Now they face both PH and MoA, if MoA would be in CH, they'd face only one, and in a diminished form, just as nightgerbil said. You realize you just took the bait and made a free advertisement for their viceroy program? Knowing it would turn out this way, was that the plan all along? So " you have a funding agreement with Gevlon Goblin that is contingent on contuing to fight goons. I would not want to endanger that and would encourage you to continue to use those monies to fight us,"
"We would not want you to lose your ISK from Gevlon, so, please, continue shooting at us" suddenly means "Please, we want you to please stop shooting at us"? I agree with Anon, no one thinks MoA so much as posts on reddit without getting tacit approval first, let alone have discussions with Grrrr Goons, so, any mail you send to any MoA individual will always end up on your desk, and usually posted in your blog. Free publicity. Keep up the welfare ganking of MoA, it brings us readers lots of entertainment and the goons "content"..."
You are an idiot haha.